Why wait for the new Tesla Roadster? Tesla may be known for humiliating supercars with the drag strip-dominating Model S, but the electric carmaker first made a name for itself nearly a decade ago with the Roadster. Based on the Lotus Elise, it established Tesla as a pioneer for electric car technology. A successor to the Roadster isn’t due to arrive until at least 2019, and unlike the original it won’t be based on a Lotus. So the people at Onpoint Dyno decided to create a spiritual successor by converting a Lotus Evora 410 into an electric sports car. 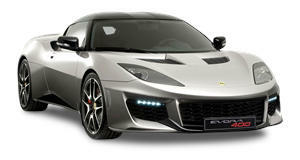 Dubbed ‘Blue Lightning,’ InsideEV reports that the electrified Evora uses the powertrain from a Tesla Model S and two Chevrolet Volt batteries. After just five months, it's nearly ready to hit the track. Currently, the 410 is the fastest and most powerful street-legal Lotus available in the US, with a 3.5-liter V6 producing 410-horsepower and a 0-60 mph time of 4.1 seconds. Putting the Blue Lightning on a dyno confirmed that it produces around 460 hp, making it more powerful than any production Lotus. The only downside is that cramming Tesla tech into the Evora has made it heavier, but the obscene amount of torque it can produce at zero revs more than makes up for it. You have to wonder how it handles, though – Lotuses are supposed to handle like go karts after all. Onpoint Dyno also replaced the original Lotus gauges with a digital dash, and fitted it with sticky Pirelli PZero Trofeo R tires. The Blue Lightning’s acceleration is brutal, to say the least, violently forcing the surprised passenger back into their seat in the video. Drive it with a bit more restraint, and the charge should last around 125 miles. It’s still a work in progress project – there’s no power steering, racing brakes or air conditioning yet, and the ear-splitting noise of the powertrain sounds like something out of Star Trek, but that only adds to its charm. All going well, Blue Lightning should be ready to tackle the track in just over a month.